Puri is one of the holiest destinations in India, by default means a religious visit to the Jagannath temple - one of the four sacred dhams of the Hindu religion. The magnificent Jagannath temple is dedicated to the Lord of the Universe (Jag-universe/ Nath-lord). It was built in the 12th century and is considered as one of the tallest (65 m) temples in India. Built in the Kalinga style of architecture, the temple consists of Jagmohan (hall) and the Deul (main shrine) in its front. 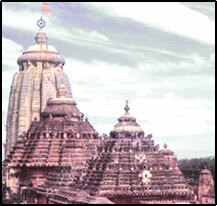 The Nata Mandir and the Bhoga Mandir were built later in the 14th and 15th century in the typical Orissa style. The provision of having meal made of the ingredients donated to the temple is a unique feature of the temple. We welcome you to the most exciting tourist attractions and travel destinations which are given below. We take into notice each and every details about recreation, entertainment, adventure and relaxation. By looking at the things to do in a city one can see if that spot offers romance, family fun, sightseeing or adventure. Drill down into the tourist attractions below to find out more about each place and see how the local customs create a unique atmosphere. The Gundicha Ghar or Gundicha temple is another important site to visit in Puri. Regarded as equally holy this is considered as the place of Lord's aunt Gundicha. According to the local belief Lord stays here for 9 days during the time of the famous Rath yatra or Chariot pulling festival of Puri. On the day of the Rath Yatra, Jagannath, Balabhadra and Subhadra are ceremoniously taken in gorgeously caparisoned wooden rath (chariot) from the Jagannath temple to Gundicha temple. At the garden house, their aunt greets them by feeding them padoapitha (specially baked rice cakes). This event also makes an important part of the famous Rath yatra festival of Puri. Perhaps the only walkable beach on the eastern coast of India is the Puri white sand beach. Puri beach is characterized by its utter simplicity, the sweets and snacks hawkers, the wonderful and loving people, and the widespread white sand with the waters from Bay of Bengal continuously washing your feet while you walk. Though dirty at some places because of the commercial set ups nearby, you can still have the much needed evening walks in the remaining clean stretch. A lazy walk by the sea with few sips of hot and made on the spot tea or tender coconut add up to that heavenly experience. Moreover, you can also request the local boatman for a boat ride into the sea. Rath Yatra - The biggest and the grandest of all festivals, the highlight is the sacred journey of the statues of the Lord Jagannath of Puri with brother Balabhadra and sister Subhadra from main temple to Gundicha Temple, where they remain for nine days. The mammoth wooden chariots carrying the three deities pulled by thousands of devotees, present a spectacular scene. The yatra (journey) begins on the second day of the lunar month (asadha). The Rath Yatra is also known as Car Festival. An annual festival commemorates the journey of Krishna from Gokul to Mathura. It also symbolizes a journey to light from the dark, which commences on the 2nd day of the bright fortnight in the month of Asadha (June/July). Dola Yatra - Dola yatra is a significant week-long festival,starts from phaguna sukla dasami and ends on purnima,is celebrated to welcome the spring season. Associated with the Radha-Krishna cult, this is an occasion for Lord Krishna to accept bhoga from every home of the town by moving in a Viman. The bhoga is called 'Dwaribhoga'. A hutment is doused in fire to invite the deity back into the temple called 'Aai Ghara' and coloured powder is smeared ober the deity. The legend of the demon king Hiranyakashipu and his son Prahalad,the greatest devotee of Vishnu exemplifies the omnipotent power of the divine. The death of his aunt Holika is the fire and Prahalad escaping unhurt shows that he who choose the God's path can be invincible. The 'Gomata'(Cow) is also venerated as a mother on Dolapurnima. The cowherd(gopala) community go for a musical procession in the by lanes of the town and sing and dance with a lot pious fervour. The idols of Radha and Madanamohan are worshipped in a swing(doli) throughout the night. Chandan Yatra - This fewtival begins on the third day of the bright fortnight of Baisaksh Akshay Trutiya for 21 days (April-May). The first 21 days are called Bahar Chandan, because during this period the images of Rama, Krishan, Madanmohan, Laxmi and Saraswati are taken out side, in a procession daily to Narendra Tank. The five Shivas known as Pancha Pandavas namely, Lokanath, Yameswar, Markendeya, Kapal Mochan and Nilakanth with Lord Madan Mohan (the representative of Lord Jagannath) to the Narendra Tank. In a well decorated boat Madanmohan, Laxmi and Saraswati are placed and in another are placed Rama, Krishna and five Shivas for cruising in the tank with the accompaniment of music and songs. This is known as outer Chandan Yatra. By Road : Excellent road network serves people to enjoy a comfortable journey to and from Puri. By Air : The nearest airport is Biju Patnaik Airport located 60 kms from Puri in Bhubaneshwar. The major domestic carriers like Indian Airlines operate regular flights from New Delhi, Kolkata, Visakhapatnam, Nagpur, Hyderabad, Chennai and Mumbai. By Rail : The railway terminus of the city offers express and super-fast train connections with Mumbai, Delhi, Guwahati, Hyderabad, Thiruvananthapuram and Kolkata .